"A tropical smoothie created for my daughter's school project about Florida's natural resources." 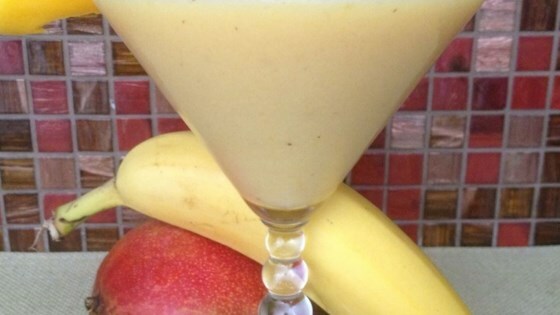 Blend mango, bananas, coconut milk, water, ice, sugar, coconut extract, and lime zest in a blender until smooth. Florida has some good resources! ( see submitter's note). Thanks Karissa and daughter. We really enjoyed this summer time smoothie! We left out the sugar and it was still yummy. I use a frozen banana and a frozen mango.. Omitted the ice. Didn't need extra sugar. Substituted orange juice and coconut milk for water. Added vanilla whey protein and a bit of ginger - delicious! I will make it again!